The following summary is useful. It's from the "About this book" section. 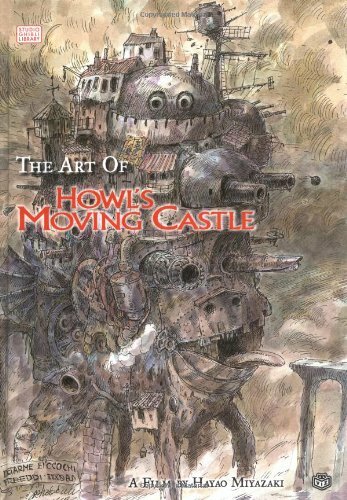 This book is a collection of concept sketches, concept art, backgrounds, character designs (including painted versions), and still images for Hayao Miyazaki's animated film, Howl's Moving Castle, based on the book by Diana Wynne Jones. All concept sketches are by Miyazaki. Concept art and backgrounds are by the art staff supervised by art directors Yoji Takeshige and Noboru Yoshida. Character designs are by supervising animators Akihiko Yamashita and Takeski Inamura. The background art and still images for this book were created from digital data. Scene images without captions are still images. The book is split into 3 parts. Part 1 is about Miyazaki's concept sketches. Part 2 contains concept art, background art, character designs and concept sketches. Part 3 is the script, or final screenplay. If you've other Art of series book from Miyazaki's movies, you'll not be unfamiliar with the content of the book. There are lush paintings, incredibly creative colour pencil storyboards and plenty of movie stills. The concept art pieces are presented linear to the movie's storyline. Captions that follow explains the scene for the movie, which is useful to relate back to the film. Throughout the book, there are breaks with narration from the art directors and animators explaining the movie's production process. They would talk about animation, colour design, research and characters. There's a short section that explains how computer graphics was used to overcome the limitations of cell drawing, which I thought was rather interesting. There are several versions of the book. The one sold on amazon.com is published by VIZ Media and contains the final screenplay. It's hard covered. thank you for this, the video and images are very helpful. i want to buy this book, I just wanted to make sure it had the right sort of things in it. hello! i was just wondering, are there any noticeable differences print quality wise or anything of the sort, between the english and japanese versions? i notice that one's 252 pages, one's 256, so it seems that they're pretty much the same? thanks in advance! Not much difference. The Japanese edition typically use paperback textured cover. The extra pages are actually blank pages - some publishers like to include these.